Okay Princesses in Training--it's time to get to the final details of what you need to know about the Princess Half Marathon! If you missed Part 1, check it out HERE. Let's get on to the running events! First, a note about host hotels and transportation. ALL Disney hotels are host hotels for Princess (just like at marathon weekend). That means if you are staying on property, there are buses to and from all race events. I personally prefer to take these buses--I'm not awake enough at 3 am to drive anywhere, let alone navigate the road closures and traffic on race morning. I know some people would disagree, but for me, the buses have always been the way to go. If you are staying off property, check with your hotel for bus information. If you're driving, be sure to be there early (especially for the half) and be aware of road closures that start early. The Princess 5k will be held on Friday, February 20th at 6:15 am. 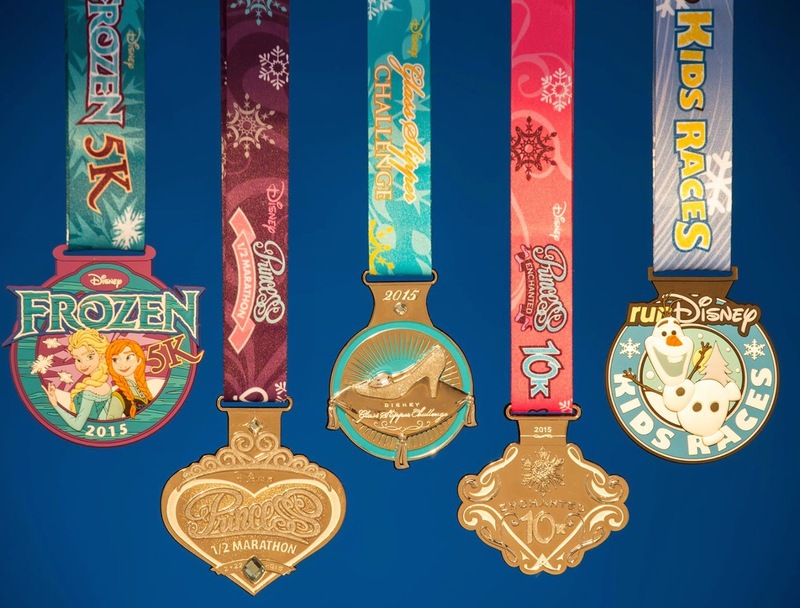 The theme is Frozen, so I expect some great themed start and finish lines, as well as some great costumes! The course starts in the Epcot parking lot and the goes through the park. The 5k is untimed, but you should still be prepared to keep a 16-minute/mile pace. The Princess 10k, as well as part 1 of the Glass Slipper Challenge, is Saturday the 21st at 5:30 am. Prepare for a really early wake up call! You'll want to be on the buses by 4:30. The course starts in the same place as the morning before, but you see a little more Disney...3.1 more miles of it to be exact. The whole course, however, still only goes through Epcot. Most of the first part of the course is on the roads, so don't be surprised when it's a little dull at the start. The silver lining is that at least it spreads everyone out and you'll have some time to get your pace going. Then on Sunday, at the early, early time of 5:30 am, you'll be off on the main event: The Princess Half Marathon! I haven't actually run this race, but by all accounts, it is the same course as the WDW Half in January, which I've run a few times. You will travel through Epcot and Magic Kingdom, with lots of time on the streets between the parks. Be aware of some tight spots along the course, commonly referred to as "cone alley". You want to be sure, especially if you are run/walking, that you signal so runners behind you know you are slowing down. It can be frustrating, but just enjoy the moment! No use in getting upset...just have fun! For all of you participating in the Glass Slipper Challenge, be sure to head to that tent at the finish to collect your medal. Also, you Coast to Coast Challengers will have another area to collect your medals. Of course, now it's time to celebrate! So get your park tickets and head to the parks sporting your medals! There's tons more information, so if you have more questions that haven't been answered, check out the official guide HERE. See you in a few days!!! !